[PDF] The Seven-Day Total Cleanse: A Revolutionary New Juice Fast and Yoga Plan to Purify Your Body and Clarify the Mind | Free eBooks Download - EBOOKEE! Description: A Cleanse for Both Body and Soul Gain clarity of purpose and peace of mind while losing weight and detoxifying your body Everyone wants a slimmer body, but you may not realize that a balanced mind and soul are the bedrock of true health and beauty. 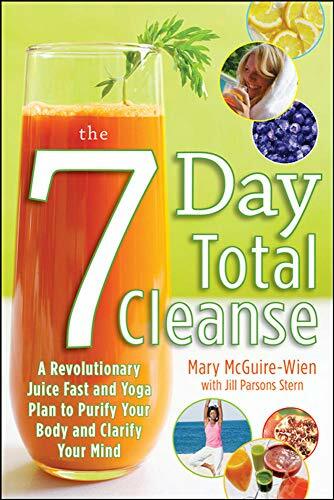 The Seven-Day Total Cleanse is a revolutionary seven-day juice fast that helps you shed weight and eliminate harmful toxins-all while restoring your emotional and spiritual wellness. Author Mary McGuire-Wien has guided thousands of clients through this unique program, which uses nutrient-rich juices, meditations, yoga, and self-care activities to cleanse the body, renew energy levels, and refresh the mind and soul. LET JUICE FASTING CHANGE YOUR LIFE There are plenty of fad diets that help you quickly drop a few pounds only to gain them back as soon as you start eating normally. But the Seven-Day Total Cleanse not only jump-starts weight loss but also fosters a mind-body connection, offering benefits far beyond the physical changes you experience when you stop eating. The Seven-Day Total Cleanse: Helps you achieve lasting weight loss and rid your body of unhealthy, energy-depleting toxins Includes delicious juice and raw food recipes Offers daily beauty indulgences to pamper yourself while you cleanse or at any time! No comments for "[PDF] The Seven-Day Total Cleanse: A Revolutionary New Juice Fast and Yoga Plan to Purify Your Body and Clarify the Mind".